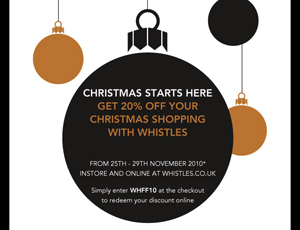 Christmas starts here at Whistles: 20% off your shopping this weekend! 25% Off at Myla with Grazia Magazine, until 2nd December 2010! 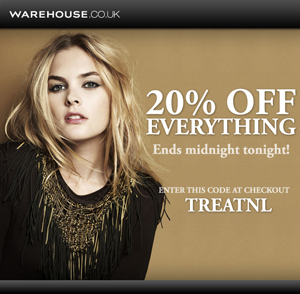 20% OFF EVERYTHING AT WAREHOUSE.CO.UK, ENDS MIDNIGHT TONIGHT. Start shopping NOW, click here. Enter code at checkout TREATNL. 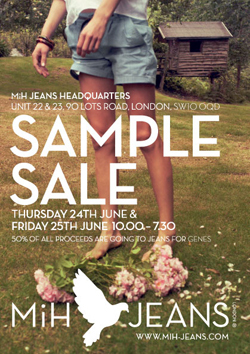 knomo SAMPLE SALE – Up to 70% off! Exclusive Mischa Barton Handbags: Online Sale! Studio TMLS Mid Season Sale – 30% off the whole SS10 collection! Happy shoe shopping! !